“Freedom is not Free.” We’ve heard that again and again through the years. It sounds pretty hollow to some. But to others: not so much. Those are the ones whose family members have paid in part the price for our freedom by giving their lives. While we are at the lake, cooking out, playing golf or bicycling, visiting loved ones on our day off, let’s pause for at least one moment and say, “Thanks” — thanks for all of those who gave their lives and for those who were left behind who together paid (and many are still paying) that price. 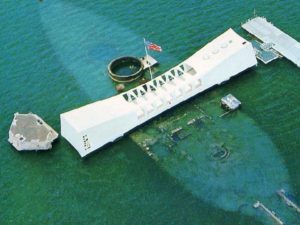 A number of years ago I sat with my father-in-law in the Pearl Harbor WWII theater watching the movie presentation of the Japanese bombing of Pearl Harbor 75 years ago. It was gut wrenching to say the least. After the movie, we all boarded small boats for the short jaunt out to the Arizona Memorial in the Harbor. As we stood there looking down into the water, droplets of oil and air bubbles popped at the surface. The oil and air came from the Arizona down below where a couple of thousand valiant Americans are entombed, left there forever. Thousands of men and women gave their lives in that “War to end all Wars” that didn’t end all wars. 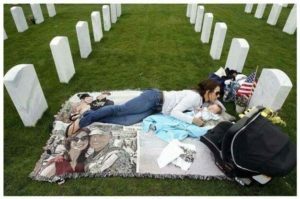 But there are today still thousands of men, women, and children whose loved ones paid that price in places all over the Globe to protect and maintain the freedom in the greatest country in World history. Most would do it again if they were asked to.